Through tears of agony I wrote you a letter six months ago to which you never acknowledged. I’m sure you got it, and I’m sure you’re aware of the 192 children that have been killed by pit bulls in the US, and the 279 adults who have been killed by them… and the thousands who have been disfigured and severely injured from vicious attacks – half the time from trusted pets who had shown no signs of aggression before that. Yet rather than warning the public about the truth that pit bulls were bred for hundreds of years to fight to the death and therefore not suitable to be household pets, you are still telling lies that “it’s all how you raise them.” And now you’ve got a new program with Villalobos Rescue Center pairing “well trained” service dogs (including pit bulls!) with physically impaired children?!! Unbelievable! 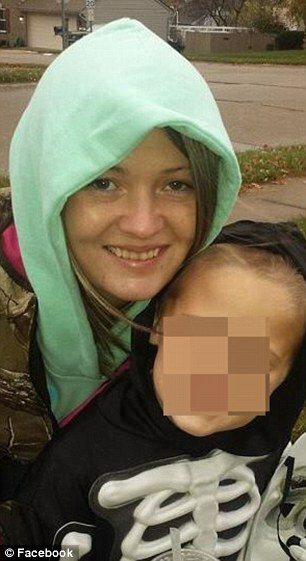 I can’t even imagine the absolute fear and horrific unimaginable pain this single mother of one felt as she was brutality attacked by her ex- boyfriend. 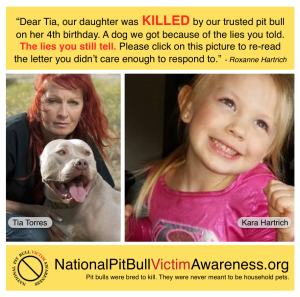 Kim S.
Why don’t Pit Bull advocates have a soul? Soul is what pierces through our carefully-constructed defenses that protect us from life’s harsh realities and throws cold water in the face of our denial. Why don’t Pit Bull advocates have a soul? Don’t they have souls? They insist that we better be sorry for vilifying the breed doing the deed or they will make us sorry. Who reading this has not been threatened with violence and invasions of privacy by Pit Bull advocates? You’ll know soul is present when you can no longer lie to yourself about whatever it is you’ve been pretending not to know. Soul demands nothing less than the truth. Can anybody help pay Kim’s electric bill? I guess we all can tell by the gofundme below that if one or both of her two Pit Bulls maul and / or attack that their won’t be any money forthcoming to pay for medical bills. Perhaps instead of spending hours bashing, baiting, and antagonizing Pit Bull victims her time would be better spent getting a job to pay her bills. What kind of mother risks getting the electricity shut off so that she can spend day in and day out making anti BSL videos on youtube and blogging about how terrible Pit Bull victims are?